Last month a fire caused $750,000 worth of damage at a Boston area car dealership. Investigators determined the cause was a 2004 Jaguar with electrical problems. The fact that a ten year old Jag would have electrical problems seems quite improbable, but this really did happen. Seriously. According to the Boston Globe, on Sept. 22 a fire ripped through Herb Chambers Land Rover Jaguar and destroyed 19 vehicles including: Jaguars, Range Rovers, Land Rovers, and Jeeps. No one was injured in the blaze. Shortly after the fire was contained investigators determined that the blaze originated from a 2004 XJ8 that was undergoing electrical repairs from a previous fire. 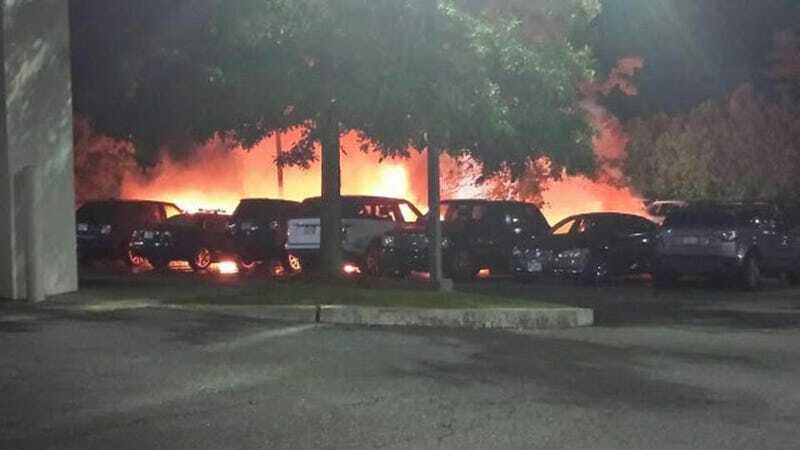 "Whether the dealership fire was caused by the original mechanical malfunction that the mechanics working on the car [where the fire originated] had not yet identified, or another electrical or mechanical failure, cannot be determined," according to fire services. Because of the extensive damage to the car, specialists and investigators are unable to determine the exact cause of the fire, but "there is no evidence to suggest that the fire was intentionally set,"
So in the future Jaguar mechanics, do not park the car with a history of fire and electrical problems near other cars.